The Irish Catholic Bishops’ Conference has warmly welcomed the announcement today by the Holy Father Pope Francis that he will attend part of the 9th World Meeting of Families which will take place from 21 – 26 August in Dublin on the theme, ‘The Gospel of the Family: Joy for the World’. Pope Francis, who is 81 years of age, will arrive in Dublin on Saturday, 25 August, and will take part in the ‘Festival of Families’ in Croke Park. The Festival of Families is the faith-based cultural concert of the World Meeting of Families six-day programme. The next day, Sunday 26 August, Pope Francis will be the chief celebrant at Holy Mass in the Phoenix Park and this liturgy will bring to a conclusion the World Meeting of Families 2018. Full details of the papal schedule will be released at a later date. 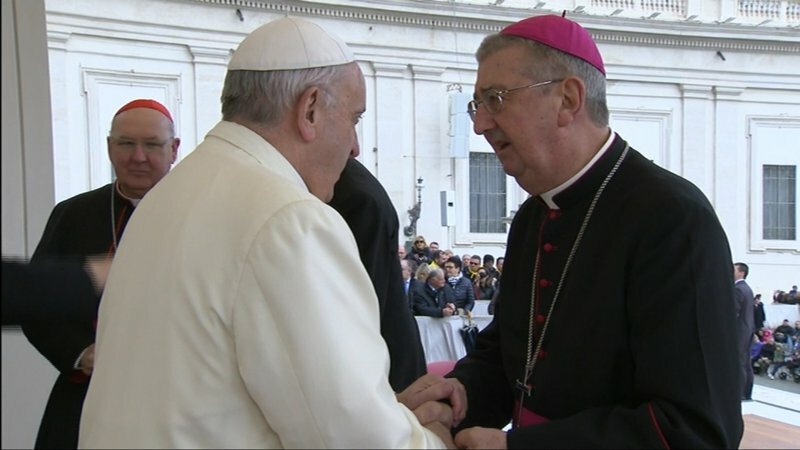 Bishops continued, “Archbishop Diarmuid Martin of Dublin, as President of the World Meeting of Families 2018, has been charged with undertaking the significant task of organising this global celebration and each of the other 25 dioceses on the island of Ireland is supporting the host diocese to ensure its success for the whole country and for the world. We eagerly await the visit of Pope Francis which no doubt will be an occasion of spiritual renewal for our laity, religious and clergy as well as a strengthening of Christian family life. Also today in Rome two Irish families presented the official World Meeting of Families 2018 ‘Icon of the Holy Family’ to Pope Francis during his weekly general audience in Saint Peter’s Square. The Tobin family are from Co Kildare and the Bushell family are resident in Rome. The delegation was led by Archbishop Diarmuid Martin, President, and Father Timothy Bartlett, Secretary General, of the World Meeting of Families 2018. The group also included the iconographer Mr Mihai Cucu. WMOF is an international celebration of faith bringing together a large number of Catholic families from across the globe to interact, pray and reflect on the central importance of marriage and the family as the cornerstone of our lives, of society and of the Church. On 28 September 2015, at the final Mass of the 8th World Meeting of Families in Philadelphia, USA, Pope Francis announced that the next World Meeting of Families would be hosted by the Archdiocese of Dublin in 2018.
on Sunday 26 August Holy Mass for WMOF2018 will be celebrated by Pope Francis in the Phoenix Park involving hundreds of thousands of pilgrims from Ireland and from around the world. The World Meeting of Families was a pastoral initiative of Saint John Paul II and is now coordinated by the Dicastery for Laity, Family and Life. Celebrated every three years, WMOF was first held in Rome in 1994, in Rio de Janeiro (1997), Rome (2000), Manila (2003), Valencia (2006), Mexico City (2009), Milan (2012) and in Philadelphia (2015). See www.worldmeeting2018.ie for more information and you can follow @wmof2018 on Twitter and Instagram as well as ‘World Meeting of Families 2018’ on Facebook. The Tobin Family comprises Mum and Dad, Brenda and Bryan and their two children – Emma (20) and Cathal (13) – and Grandmother Maureen Tobin from Cobh, Co Cork. The Bushell Family comprises Mum and Dad, Mary and Michael and their two children Olivia (7) and Molly (5). The family moved to Rome in 2016. The official Icon for the World Meeting of Families was anointed by Archbishop Diarmuid Martin at Mass to mark the one year countdown to WMOF2018 which was celebrated in Knock, Co Mayo on 21 August 2017. Since then the Icon has been brought to parishes to help prepare people for WMOF. Pope Francis marked the fifth anniversary of his Petrine ministry on Monday of this week, 19 March, the Feast of Saint Joseph. Since then the Holy Father has undertaken 18 trips within Italy and has travelled a total of 250,000 kilometres on 22 international visits to: Brazil, Jordan, Palestine, Israel, South Korea, Albania, the European Parliament in Strasbourg, France, Turkey, Sri Lanka, the Philippines, Bosnia and Herzegovina, Ecuador, Bolivia, Paraguay, Cuba, the United States, Kenya, Uganda, Central African Republic, Mexico, Greece, Armenia, Poland, Georgia, Azerbaijan, Sweden, Egypt, Portugal, Colombia, Myanmar, Bangladesh, Chile and to Peru.